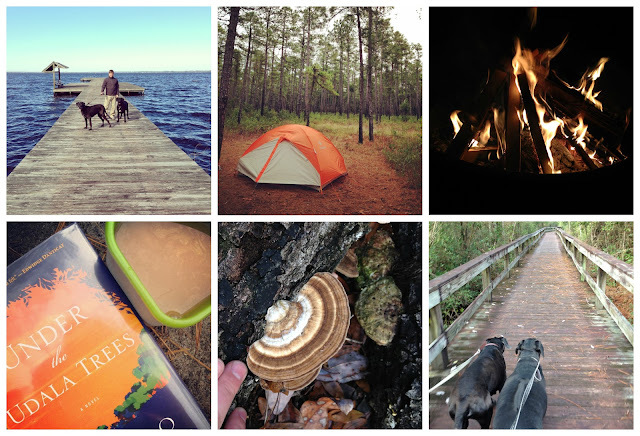 For New Year's weekend, Nathan I packed up the dogs and our brand new tent (a Christmas gift to each other) and went camping at Lake Waccamaw State Park, located about an hour west of Wilmington. A visit to Lake Waccamaw State Park unveils one of the most unique bodies of water in the world and one of the greatest geological mysteries—the phenomenon of Carolina Bays with species of aquatic life found nowhere else. A 700-foot boardwalk reaching into the shallow, tea-colored water accommodates wildlife viewing and fishing, and more than seven miles of trails allow hikers to explore multiple ecosystems and rare plants. Fifty-two species of game and non-game fish are at home in Lake Waccamaw. 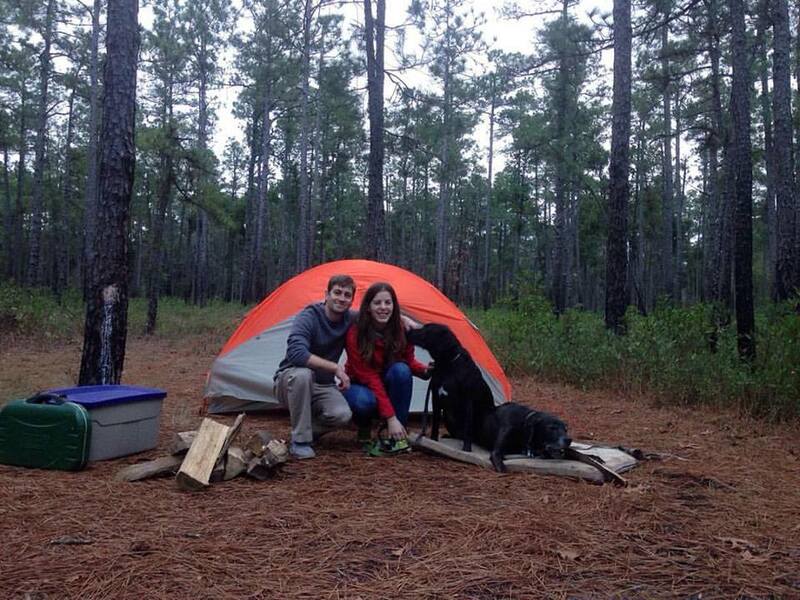 Camping is primitive at four hike-in group sites, and a boat ramp allows lake access for paddlers and small boats. A visitor center with exhibit hall and free interpretive programs explore the region’s diverse natural and cultural history. We've driven by this park countless times on our way in and out of Wilmington, and each time we would say, "We should really check that place out." Well, Nathan and I both had three-day weekends thanks to New Year's Day (a rare gift) and his 2016 resolution is to take better advantage of the fact that we live in coastal North Carolina, which, by the way, is a pretty beautiful place. Thus: our camping trip finally came to be. After 5 tries, I figured out how to take panoramic photos on my iPhone! Overall it was a quiet and peaceful weekend. Although we used to camp all the time in Texas, we've only gone sporadically since moving to Wilmington, so we were a bit rusty. We were woefully underdressed and also unprepared for the cold, cold weather. Yes, it was January 1st, but it was 80 on Christmas. You can see why we might have forgotten to pack hats or gloves or even an extra pair of socks. Also, Calvin - despite being mildly obese - shivered all night in our tent, so I woke up every half hour. On the bright side, we had a big, private campsite all to ourselves, Nathan was able to take some photos for his fungi Instagram account, we read books and drank coffee/wine by the fire, and we got to kick 2016 off outside and with each other. I'd say it was a success. I hope your New Year was just as lovely but significantly warmer. On to the next adventure!